Although Coragyps atratus has been used as a traditional therapy for patients with cancer, the scientific literature does not contain enough information on how this therapy is used or the mechanisms that explain this therapeutic practice. To understand the methods of use and the reasons given by patients and caregivers for the use of Coragyps atratus in cancer treatment. This study used a qualitative design based on twenty in-depth interviews of patients with cancer or caregivers of patients with the disease. The analysis of the text was based on an inductive thematic approach. Resistance to disease and immune enhancement are properties attributed to Coragyps atratus when used for cancer treatment. The most recommended method of use is fresh blood ingestion, and the associated mechanism of action is transfer of immune factors to the individual who consumes it. Use of Coragyps atratus as a treatment for cancer is a popular alternative therapy in Colombia. More studies are needed to understand the clinical effects of this intervention in cancer patients. Aunque Coragyps atratus se usa tradicionalmente como terapia para pacientes con cáncer, no existe suficiente información en la literatura científica sobre su forma de utilización ni sobre los mecanismos explicativos que subyacen a esta práctica terapéutica. Conocer métodos de utilización y mecanismos explicativos dados por los pacientes y cuidadores de pacientes sobre el uso de Coragyps atratus en el tratamiento del cáncer. Diseño cualitativo basado en veinte entrevistas en profundidad de pacientes con cáncer o cuidadores de pacientes con esta enfermedad. Análisis de texto basado en enfoque temático inductivo. Al Coragyps atratus se le atribuyen propiedades de resistencia y fortalecimiento del sistema inmune de personas enfermas de cáncer. La forma de utilización mas común es la ingesta de la sangre fresca y el mecanismo de acción asociado es la transferencia de defensas a quien lo consume. La utilización del Coragyps atratus como tratamiento para el cáncer es una terapia alternativa usada popularmente en Colombia. El uso de este animal debe estudiarse más a fondo para conocer los efectos clínicos en los pacientes con cáncer. The American Black Vulture (Coragyps atratus) is a species of scavenger bird first described by Johann Matthäus Bechstein in 1793, which is widely distributed throughout the Americas (Figure 1). In Colombia, Coragyps atratus is commonly called “chulo”, “gallinazo”, “zamuro”, or “golero”. These birds are generally found in open and semi-open areas and are most numerous in the outskirts of cities, primarily in garbage dumps or landfills . Although Coragyps atratus is primarily a scavenger bird, it also attacks young and small animals . American Black Vulture. American Black Vulture (Coragyps atratus). Illustration by RSP. Use of the Black Vulture in medicine dates back to the Roman Empire, when it was mentioned as a health treatment in texts such as Naturalis Historia, written by naturalist and philosopher Pliny the Elder . Currently, this species has not been widely studied in basic and clinical research on human health . 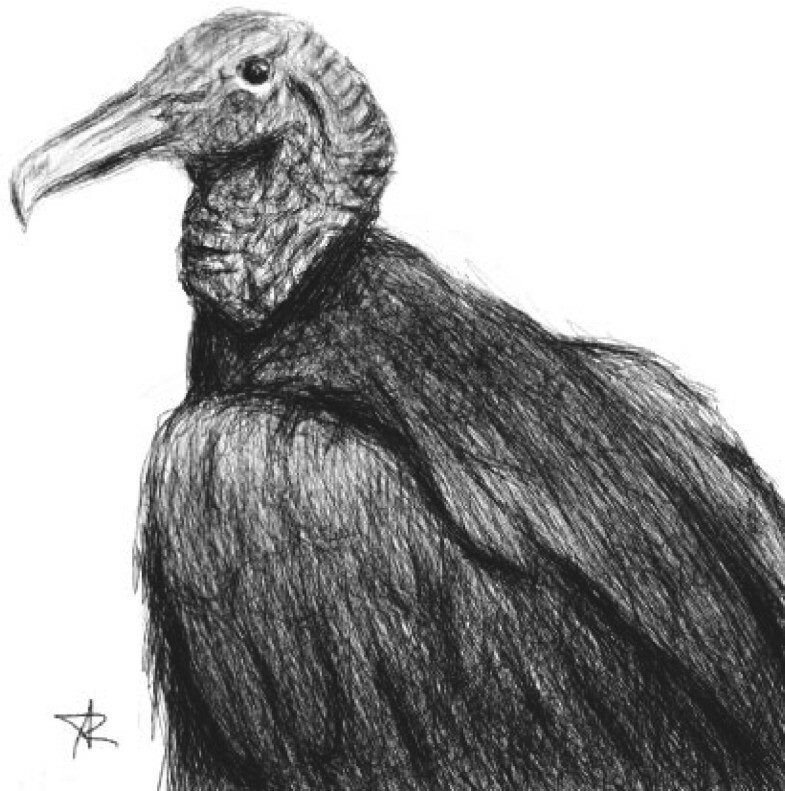 However, in the area of complementary and alternative medicines (a group of medical systems and health care that is not considered part of conventional medicine, is not systematically taught in medical schools, and is not available in official health care systems ), the use of the American Black Vulture has been reported for the treatment of cancer patients. In a prevalence study performed at the Instituto Nacional de Cancerología (National Cancer Institute) in Colombia, 73.5% of 264 people surveyed reported to have used some type of complementary and alternative medicine for cancer treatment, and 2.2% of those surveyed had used Coragyps atratus for treating the disease . In international literature, articles on the use of the American Black Vulture or other similar species in cancer are scarce [7, 8]. Ethnomedical literature, however, has many examples of use of animal products for cancer treatment. Among the animals with anticancer attributes mentioned are Boa constrictor Bos indicus Bos taurus, Brachyura spp., Bufo sp., Capra hircus Capra mambrica Cathartes aura Caudisona durissa Chelonia mydas Cnemidophorus ocellifer Coendou prehensilis Colomesus psittacus Crassostrea rhizophorae Crotalus atrox Crotalus durissus Crotophaga sulcirostris Echinaster echinophorus Eunectes murinus Geococcyx californianus Hippocampus reidi Inia geoffrensis Kerodon rupestris Leptodactylus labyrinthicus Melipona scutellaris Mephitis macroura Oreaster reticulatus Periplaneta americana Rhinella jimi Rhinella schneideri Sotalia fluviatilis, Sotalia guianensis Spilotes pullatus and Trichechus manatus[8–16]. Use of the Black Vulture in alternative and complementary medicine for cancer has also been described in non-scientific publications, such as local newspaper reports [17–19]. To date, we have not found studies that elucidate the use of this particular bird as therapy for patients with cancer and the explanatory mechanisms that lead to this practice. Participants who agreed to take part in the interview were asked for permission to record the interview. None of the participants objected to this type of documentation. The interviewer was a clinician with experience in this methodology, and note taking was allowed during the sessions to document content and processes that could not be registered on the recordings and could affect the interpretation of the content (for example, emotionally tinged responses). Both transcriptions of the interview recordings and notes taken by the interviewer during the sessions were used as analysis material; an inductive thematic approach was used to ensure that the themes and concepts were generated from the actual material . After eighteen interviews, the information found was considered redundant. Taking into account the criteria for saturation , two additional interviews were conducted, which completed a sample set of twenty participants. To facilitate the organization and coding of the material, the software ATLAS.ti version 5.0 was used for managing the qualitative data. This software allows computer assisted qualitative data analysis using several tools: a code manager for simplifying the process of coding, sorting and detection of the most frequent codes in the text; a query tool for combining different codes and code families, and a network editor for visualizing connections and relationships between codes. Themes emerge as an outcome of coding, categorization and analytic reflection. Transcriptions of the interviews and interviewer’s notes were read independently by two researchers responsible for the analysis. After the initial reading, a meeting was held between the analysts and the researcher who conducted the interviews to clarify questions regarding the material that was read. Each of the analysts then independently performed a pre-codification of the categories. In another meeting between the analysts and the interviewer, a consensus was reached on the final coding categories. Finally, these categories were grouped by relevant themes that responded to the questions posed by the study. An attempt was made to reflect the veracity and validity of the data through the use of iterative procedures (sampling, initial reading of the material, pre-codification, codification, and generation of themes) and with the literal transcription of fragments of the material provided by the participants. The group of interviewed participants contained eleven women (55%). Most participants had been diagnosed with cancer of the hematopoietic system (Table 1). For each of the identified categories, commentaries, synthesis, and transcriptions are presented that attempt to support the ultimate interpretation of the data. In some instances, the transcriptions were edited to facilitate the reading and to focus on the fundamental points. The symbols “/…/” are used in some transcriptions to indicate that the points previous to the symbol and following the symbol come from different blocks of the transcription but correspond to the same account. For each quote, the corresponding participant number is provided. Results are grouped into three categories according to the coding that were used for the transcriptions. This study attempted to obtain information regarding the manner in which a group of patients use Coragyps atratus as a treatment for cancer, how they administer this therapy, and the explanatory theories for the mechanism of action of the treatment. A large proportion of the findings coincide with what has been described in non-scientific literature, including the attributed properties, the preparation and the role of increasing body temperature during the administration [17–19]. Furthermore, use of other animal products in addition to blood coincide with those described in studies made with different vultures . In the use of Coragyps atratus as a therapy against cancer, an ample gamut of administration methods was found. Among this variety in the methods of use, the ingestion of blood seems to have the greatest relevance as a therapeutic approach. We believe that the importance given to this approach is related to the belief systems rooted in different Western and pre-Columbian cultures. The importance of the blood as a container of elements that can produce an illness such as cancer or even determine temperament has been highlighted in some studies that explore beliefs around transfusions . In the XVIII century in Europe, human blood, preferably consumed warm, was thought to have important therapeutic utility . In some pre-Columbian American cultures, the blood possessed a strength so powerful that it could not be touched by anyone other than priests, who offered it to the gods in ritual sacrifices . The results indicate that the consumption of Coragyps atratus in preparations such as bouillon, broth, or a cream that includes pieces of the bird are generally administered in conjunction with the ingestion of the blood. In accordance with psychoanalytical approaches, ingesting the body parts of another being transfers the qualities and powers of the devoured to the devourer . The other methods of administration of Coragyps atratus can be associated with the need to prolong the period of treatment: the recommended period of use was found to be nine days or nine weeks, which requires the collection of a large number of birds that are not easily acquired and implicates a high cost for the patient and caregivers. In consequence, systems of commercialization of these products have been developed and seem to exist in the form of powder preparations, which last longer and can be more easily administrated than other preparations. The participants did not offer information that allowed for an explanation of why the duration of the treatment is associated with the number nine (nine days or nine weeks). This number seems to have a mystical meaning and it is present in witchcraft and shamanic rituals as well as traditional medicine practices from other cultures [26, 27]. It is believed that using a treatment for nine days grants therapeutic continuity, prevents development of tolerance to the substance and avoids occurrence of either toxicity or side effects . Powers attributed to the number nine can be related to its odd nature (it is believed that an odd number of administrations results in a positive result because every even dose counteracts the previous one) and its religious attachments (nine is associated with the holy trinity, in many catholic traditions prayers are made during nine days, which is called the “novena”, a term also found in descriptions of ethnomedical practices in Spain) [26, 28]. Another element that was discovered in this investigation was the practice of raising body temperature as a strategy of reinforcing the treatment with Coragyps atratus. The use of heat as an element has been introduced in other therapeutic inventions, with jackets, the ingestion of hot drinks , or as in the custom of “sweating a cold” , and is supported by the explanation that in some biological systems, the increase in temperature is related to efficient control mechanisms of primarily infectious processes . Another explanatory theory regarding the need for this practice is reported in non-scientific literature, in which it is related to avoiding the coagulation of blood in the stomach of the person that consumes it . In this study, the mechanism of action found to be attributed to the therapy is related to the transfer of factors that reinforce immunity. The importance of immune processes has been established in studies that evaluate the mechanism of action of certain herbal therapies for example, such as Curcuma longa and Panax ginseng, which appear to have immune-modulating effects . Some studies have explored patient beliefs about factors that can be related to the appearance of cancer and have found that approximately 60% of those evaluated believe that immunological factors intervene in the production of the disease . Many recommendations for the Colombian health system are derived from this study’s results. First, awareness of zootherapeutic practices and, in general, use of complementary and alternative medicines must be increased. Further studies are needed to evaluate the effects of black vulture’s blood in neoplastic cells in vitro, as has been done with other plant and animal based remedies . In addition, clinical outcomes of Coragyps atratus use must be evaluated in cancer patients, to determine its pharmacological properties and identify possible health hazards resulting from these types of practices, especially when animal derivatives are commercialized without adequate quality control. One study has reported the presence of high levels of toxic metals in plasma and stool samples obtained from Coragyps atratus. Increased awareness on complementary therapies must also involve the clinician-patient dyad. Some studies have proposed that official healthcare systems are based on an exclusionary logic (only one type of medicine works), while patients display a proclivity to accept the use of combined strategies in an additional or simultaneous way (complementary systems) . In this study, it can be seen that patients not only combine therapies of the official systems with the administration of Coragyps atratus, but also incorporate other complementary and alternative medicine such as increasing body temperature and administering red fruit juices, the later believed to be useful in controlling anemia or inhibiting tumors [6, 37]. We believe that it is important that subsequent studies analyze the attitude of healthcare personnel towards the option of combining official healthcare systems with complementary and alternative systems. Although not expected to incorporate zootherapy in their practice standards, physicians should ask their patients about use of complementary treatments in order to provide relevant safety information as well as being capable of detect potential complications such as toxicity and drug interactions. One limitation of this study that should be noted, given the qualitative nature of the design and the sampling strategy used, is that the generalizability of the results is limited; this limitation implies that further studies should be conducted using a larger number of patients and specific sampling designs to draw conclusions with higher external validity. Although the majority of cases corresponded to cancer of the hematopoietic system, it cannot be suggested that this type of patient uses Coragyps atratus more frequently as a treatment for his or her illness than other patients. Use of Coragyps atratus as a treatment for cancer is a popular alternative therapy in Colombia. The most common way of use is fresh blood ingestion, and its attributed mechanism of action is transfer of immune defenses to the person who consumes it. Many cultural factors are involved in this practice, most of them linked to the belief systems rooted in different Western and pre-Columbian cultures. a “Como el chulo come porquerías y no se enferma, pues debe tener muchas defensas/…/como come todo en descomposición debe tener buenas defensas para que no se enferme”. b “Como viven en la basura y no se enferman, tienen buenas defensas y muchos glóbulos rojos es decir anticuerpos”. c “Me trajeron el chulo de los llanos, duró varios días en la casa, como mi hijo estaba recibiendo quimioterapia el animal duró como ocho días sin comer nada”. d “Hay un señor en la costa que los agarra y los cría con carne de enfermos, con tumores”. e “El chulo nos lo trae un señor que los coge y viene hasta la casa de uno y lo prepara, para que la persona lo consuma de una vez. Allí lo mata y le da la sangre caliente, toda la sangre que se le extrae ya que no sale más de una copadita, el chulo tiene poquita sangre. El señor cobra como 70.000 por agarrar el chulo y hacer todo el remedio”. f “Estando vivo el animal hay que degollarlo y sacarle la sangre que no sale mucha/…/se mata el chulo y se da una vez para que no se coagule, se recoge un copadita”. g “los chulos son encargados en el botadero de Mondoñedo, o a veces nos los traía un familiar de Melgar. Los traían vivos, ya cuando los teníamos aquí, el abuelo los colgaba con la cabeza hacia debajo de tal manera que la sangre se le viniera toda hacia la cabeza, luego le quitaba todo, las plumas del pescuezo y le cortaba en la parte de la vena, se recogía una copadita de sangre, ya que casi no sale”. h “Se coge el chulo, sin lastimarlo, se le corta la vena y se le extrae la sangre, se recoge media copadita la cual se mezcla con vino”. i “esta es la forma como se debe dar: se le da una copadita de la sangre mezclado con vino de consagrar”. j “una copadita de sangre que se mezcla en un vaso de jugo de mora/…/la sangre es lo mejor y se toma revueltica con jugo de mora”. k “… le preparaba un caldo diario con cada presa del animal, se hace el caldo con el chulo y la persona debe tomarse todo el caldo y tratar de comerse un presa diaria. Se puede comer todo lo que la persona pueda y quiera, es muy bueno”. l “Yo sé que una mamá se lo dio al hijo a escondidas, le dio la carne entre la sopa como si fuera un pollo”. m “Luego el resto de chulo era arreglado y despresado como una gallina, y se le preparaba diariamente una presa”. n “Se prepara un caldo hasta que se deslía el chulo que solo quede el hueso, el caldo se le da al niño”. o “Se cocina mucho tiempo hasta que se deslía todo el chulo, queda como un vaso”. p “Al otro día, el otro chulo se asó hasta que quedó bien seco, se trituró, y se le agregaba de este polvo a todas las comidas que ella ingería”. q “… los huesos se tuestan y se secan y se hace la harina y con ella se hacen coladas”. r “… se le compraba el polvo de chulo seco y se le daba una cucharada de este polvo en los jugos”. s “luego de extraer la sangre se lava el chulo en agua caliente para desplumarlo, con esa agua se baña al niño y se envuelve en una sábana blanca, para que se sude, ese sudor le ayuda a sacar la enfermedad”. t “La idea es tomar el tratamiento por nueve semanas pero es difícil porque para cada vez hay que conseguir un animal”. u “se le da por nueve mañanas es decir nueve chulos”. v dicen que se deben dar por lo menos nueve chulos, pero yo solo le di 2 chulos, porque es difícil agarrarlos”. w “A la niña se le dieron nueve chulos por nueve días, esa es la forma como se debe dar”. x “se le extraía una cucharada de sangre del chulo, la cual se le daba en jugo de mora. Después de eso se ponía a trotar a la niña para que se caliente y le haga el tratamiento”. y “El hecho de que este animal coma de todo le da defensas a las personas”. z “Dicen que la sangre del chulo pude curar o le sube mucho las defensas a las personas con cáncer, porque se supone que como viven en la basura y no se enferman tienen buenas defensas y muchos glóbulos rojos es decir anticuerpos y esa sangre hace que la persona cree defensas que atacan el cáncer”. aa “por ser una ave de rapiña crean muchas defensas, y esto hace que la persona al comerlo cree defensas y se inmunice”. bb “Creo que este remedio actúa en las defensas, como es un animal carroñero, y come todo en descomposición debe tener buenas defensas para que no se enferme. Y creo que le ayuda a atacar el tumor para que no siga creciendo y ayuda a que cree más defensas/…/ayuda a atacar el tumor y sube las defensas y hace lo mismo que la quimioterapia, después que yo le di ese remedio no tuvieron que hacerle más quimioterapias”. cc “Este remedio es bueno porque dicen que tiene unos microbios que atacan las células malas y suben las defensas del niño, eso ayuda a que se sane”. dd “Yo sé que una mamá se lo dio al hijo a escondidas, le dio la carne entre la sopa como si fuera un pollo, el hijo no se dio cuenta que le estaban dando el tratamiento y se curó del cáncer, tenía cáncer en un testículo”. Ricardo Sánchez-Pedraza, Magda R Gamba-Rincón and Andrés L González-Rangel contributed equally to this work. The authors are thankful for the generous financial support received from the National Cancer Institute and the National University of Colombia in Bogotá. We also gratefully acknowledge the editing services provided by the Department of Foreign Languages at the National University. RSP conceived of the study, participated in its design and coordination and helped to draft the manuscript. MGR and AGR incorporated background references, helped with the discussion and completed the manuscript. All authors read and approved the final manuscript.